3 foot 9 inch Section for Embedment in Concrete and is a hinged connection section. This short base section is set into a hole, with concrete poured around it to provide a Hinged Connection to a 25G Main Tower or Top Cap Section using double bolted joints which are proven to be the best method of joining tower sections for sturdiness and dependability. Featuring a 12-1/2" equilateral triangular design, the SBH25G is constructed of extra heavy duty 1-1/4" steel tubing side rails with continuous solid steel rod bracing. The ROHN 25G tower can be used inguyed, self-supporting or bracketed configurations according to specifications in the ROHN Tower catalog. 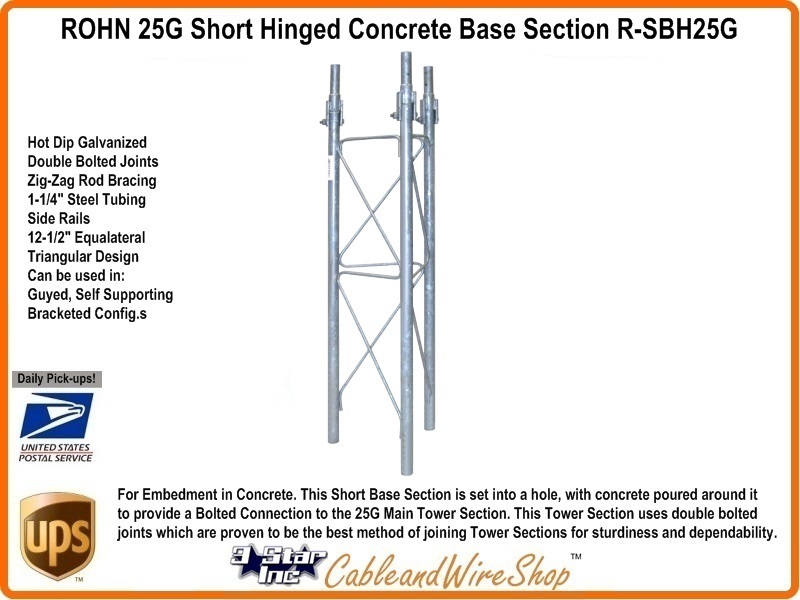 Consult ROHN Catalog Links at Footer Section below for ROHN 25G Tower Details. Note: Not Specified for use in Self Supporting Tower Applications.